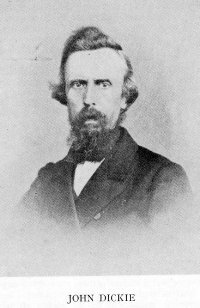 JOHN DICKIE, the writer of letters published in two J volumes under the title of “Words of Faith, Hope, and Love,” was born in January, 1823, in Irvine, a seaport town in Ayrshire, and was early bereaved of both parents. He was a delicate boy, of a sensitive temperament, modest and retiring, but of a kind and warm-hearted disposition. At an early age he developed studious habits, and he made such progress that he was enabled in the year 1841, by means of what he earned by teaching, to enter Glasgow University. About this time the great crisis of his life occurred. He became deeply anxious as to his spiritual condition; and, his conscience being tender, he felt sin to be an intolerable burden till, when between nineteen and twenty years of age, he was led to accept the Lord Jesus Christ as his all-sufficient Saviour. Yet even after this his conflicts with sinful self and the Wicked One were many and severe. The deep spiritual experiences which he thus early passed through doubtless gave character to his after Christian life. Having with his whole heart yielded himself to God, he felt that he was no longer his own, but the Lord’s, and he resolved to consecrate his life to His service. He ardently desired to become a minister of the Gospel, and to this end, after finishing his University career, he entered the Divinity Hall. But toward the close of his first session, symptoms of pulmonary consumption began to manifest themselves, and during his second year his health completely failed. He consulted some of the most eminent physicians in Glasgow, whose opinions of his case were hopeless, and under these circumstances he returned to his friends in Irvine. He gradually became worse, and for over two years his voice so completely failed that he was able to communicate with his friends only by means of the dumb alphabet. Subsequently he went to London to consult a distinguished specialist on chest diseases, but his opinion was the same as that given by the home doctors. Turning his back on the capital, he said to himself: “If it is God’s will, notwithstanding this verdict, I shall survive; if not, His will be done.” Studying his own constitution, he adopted a system of dietetics which he believed suitable, and lived a life of extreme abstemiousness. This treatment was doubtless the means of prolonging a singularly useful life for a period of over forty years. After some years his health improved considerably, and for several years he found a sphere of much usefulness as a missionary in his native town. In the year 1858 Mr. Dickie removed to Kilmarnock at the invitation of Mr. John Stewart, a well-known Christian gentleman, and a devoted labourer in the Master’s vineyard. Here he remained for about twenty years, often prostrated through weakness; but with much patience he persevered in the Lord’s work, counting upon the sufficiency of His grace. He identified himself with a company of God’s people, gathered to the Name of the Lord Jesus, who met in a building erected and maintained by Mr. Stewart. Here Mr. Dickie ministered regularly in word and doctrine, exercising the gifts with which God had endowed him. His labours among the dissipated and openly ungodly, as well as among the poor and sick, were not in vain. God enabled him to win many trophies of grace, and pluck brands from the fire. Not the least remarkable of these was a blacksmith named Philip Sharkey, a man most profane, a drunkard, and at times a terror to his neighbours. This man Mr. Dickie sought out, and, after long, patient, and prayerful effort, had the joy of winning him to trust in the Saviour; his subsequent life and triumphant departure to be with God being the evidence of his true conversion. Mr. Dickie wrote an account of this interesting case, and it was published under the title, “Philip Sharkey, the Kilmarnock Blacksmith.” The circulation was enormous; one gentleman alone purchased for distribution 100,000 copies. He afterwards wrote many other tracts and booklets, among them being “The Devil’s Cradle,” “Christian Thoroughness,” “Stewardship,” “Divine Compensations,” etc., the circulation of each reaching many thousands. He also became a contributor to severaireligious periodicals, and in particular to the Family Treasury. Besides his prose writings, Mr. Dickie wrote many poems and hymns. In the year 1878 he became so feeble in health that he left Kilmarnock and returned to Irvine to reside with his sister and her husband, Provost Watt. For a few years after his return to his native town he was enabled to go about serving the Lord, though in much physical weakness; but in the year 1882 his little remnant of strength completely failed, and for the remaining eight years of his life he was confined wholly to his room, never having been able to leave it again, except on one occasion in the summer of 1890, and that only for a few minutes. His utter weakness and sickness hindered him from seeing any but his immediate relations, who ministered to him with all the kindness that affection could prompt. During these eight years his sufferings were very great— much pain, constant sickness, excessive weakness and sleeplessness, together with nervous irritability of the brain, were his portion. Yet such was his experience of the sufficient grace of the Lord, that at the close of them he could say that “they were the cream of his whole life.” On 18th January, 1891, he gently fell asleep. When the pangs of death were upon him, his eyes being closed, he was asked if he was sleeping. He replied, “Just musing on the sufferings of the Cross,” and so, conscious to the last, he passed from this place of suffering into the presence of his Lord. His mortal remains were interred in Irvine Cemetery in presence of many friends. 3. T.